The Brunsbuettel colleagues present their profession, too: On Wednesday they exhibited at the training fair Brunsbuettel. 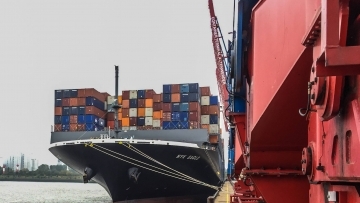 Furthermore, the colleagues provided information and photos regarding the training and working day of a shipping agent on the professional portal of the employment agency. 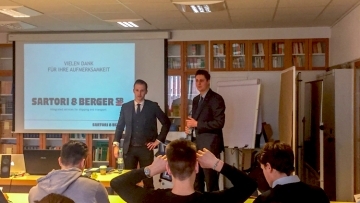 Sartori & Berger attended the state business school Berliner Tor and presented the profession as a shipping agent. 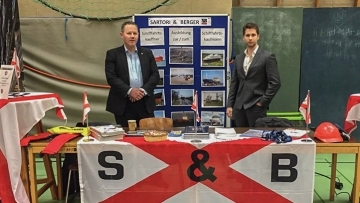 Last week the two Hamburg port agents, Pierre Sievers and Tjark Segger, visited the state business school Berliner Tor and presented the profession as a shipping agent at Sartori & Berger. They described all aspects of the handling of a vessel, the differences of cruise ships and answered all questions of the trainees. The MPI Enterprise of the NSB Niederelbe Schiffahrtsgesellschaft spent the New Year period in Hamburg due to a shipyard stay at Blohm+Voss. Beforehand SARTORI & BERGER arranged all necessary permits to enter the river Elbe and was in permanent contact with the captain to inform him about the current water levels. 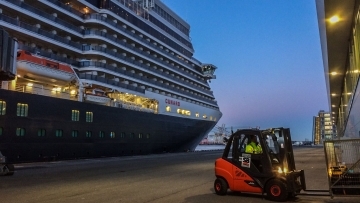 Queen Elizabeth visited the Hanseatic City on January 5th. 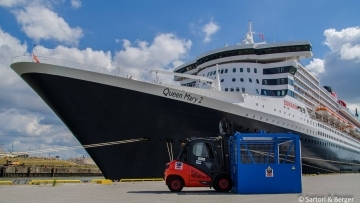 Like last year, Sartori & Berger has been appointed as agent for the Cunard fleet and is responsible for the luggage and provisions. 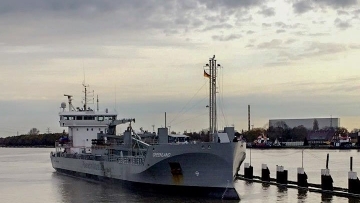 At the beginning of the week the Sartori & Berger agents in Brunsbuettel handled a very special vessel at the Holcim-Terminal: the gas-powered “Greenland” stayed overnight and was built in 2015. 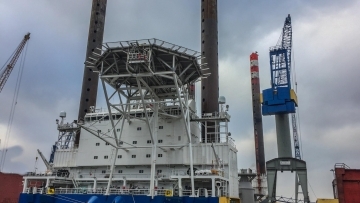 For the last 6 weeks Sartori & Berger was appointed as agent for a big offshore project. 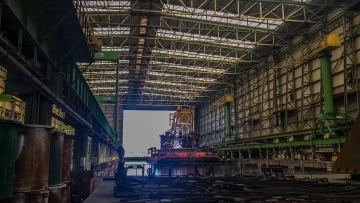 As agent in Wismar, Rostock and Stralsund we were responsible for all arrangements regarding the shipment of the jackets for a converter platform to the North Sea. As one of the airport partners and agent of the shipping companies, Sartori & Berger organizes the meet and greet of the cruise guests and the transfer from the operating airfield to the cruise ships. 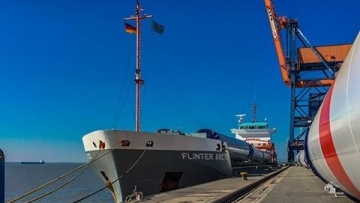 For the third time, the container vessel with an overall ship’s length of 396m has been handled by the agents of SARTORI & BERGER. During the call Sartori & Berger was responsible for the clearance as well as for luggage handling and provisioning. 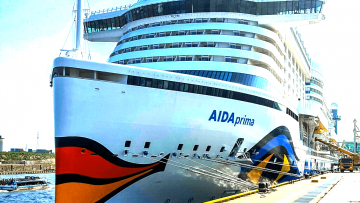 In 3 different ports the team of Sartori & Berger welcomed 4 cruise ships of the AIDA fleet on September 10th. On September 12th, 2016 MS FLINTER ARCTIC of the shipping company Flinter was welcomed by us in Brunsbuettel. 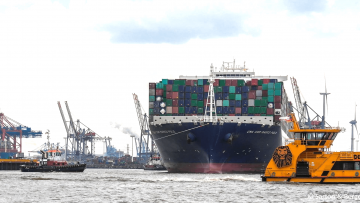 “NYK Eagle“ was welcomed by Sartori & Berger in Hamburg on the occasion of their maiden call on October, 17th.